Oh I get it, “Patience Pays Off” meaning WE have to be patient to find out the rest of the story! Not fair!! 🙂 Very excited to read the rest of the story! Congratulations!! I can’t wait to see what God has done for you! Thank you for sharing the journey with all of us! Congratulation, Crystal! So happy for you! It better be the BEGINNING of next week. I am dying to hear the story and see the house too. It doesn’t help that we are in the endless pursuit of our own dream house, so I would love to live vicariously thru you lol. Cant wait to hear all the fun and exciting details!!!!!!! Having patience is hard!!! I can’t wait to share the whole story with my husband! We, too, have committed to saving 100% down and are within a couple months of starting our house fund (just a few thousand left to go on the student loans!). We can’t wait to start and it’s so great being able to “follow” someone who’s been through it all before. Thanks for sharing your story and helping us stay motivated! I wish I’d waited. Seven years ago I bought a house. Saved a good, hefty down payment. Ignored the “just put 5% down mortgage pushers” and found the Perfect House a half hour from my work. A year later…no equity yet. Laid off from the job. No jobs in my field in the want ads, so I took the hefty 401k and opened a small business which started off well but as gas grew to $4/gal and the drive between “home”, the “business” and the “second job” was costing me most of my income, then later the business dropped off as so many small businesses have, then the house payments became impossible…and the credit cards defaulted and the foreclosure has followed. You can’t predict the future, but I would not be where I am at right now if I’d held off a bit on the house, etc. I will now work to rebuild my credit, pay off my debts and save 100% towards a future home. Excellent example you have set for us all. Congrats. Wow, you’ve certainly whet my whistle for the rest of the story! The way God comes through is never how we expect and always incredible. Congratulations Crystal!! We are so happy for you and your family!! God is so Good!! So proud of you…I use you as an example all the time! We live in New York City where the ends don’t quite meet all the time and there is nothing to buy (that we could ever dream of affording), but if we were anywhere else I would be doing it like this! I am so excited for you! It must be so rewarding to have your goals realised. We have done something similar, although I am quite a bit older than you. We made an interstate move in August 08, selling our previous home, which we owned outright, before making the move. We thought we would buy quickly but it took us 18 months to find a home that we loved that we could also pay for in cash. Although the wait was highly frustrating I am thrilled with my new (to me, it was built in 1915) home. May God bless you in all your future endeavours. Yay! Can’t wait to read more of the details of your experience. I’m so very excited for you guys! Can’t wait to hear the rest of the story! Congratulations! Oooh, the suspense! LOVE it! You’re an inspiration! God bless you! You’re an excellent example to us all! You inspire me. Looking forward to hearing the rest of your testimony! I just wanted to say I am SO happy for you. You are really inspirational and I bet you will be SO happy with the new house. Way to go! Congratulations Crystal & Family! God is so Good and always know when is the time if stay quit and listen (the hard part!). I am Happy to see that we are not the only weird ones, lol… purchased a small home cash and remodel it and now looking for THE house and paying cash as well : ) I feel your excitment, joy & proud of yourself- good job!!! Congratulations again and can’t not wait for next week! Wow, congrats! What an awesome story! We’re in the same boat you were about 7 years ago it seems. We just moved to a tiny apartment b/c we were getting no where fast on our debt and our plan to buy a house with cash. 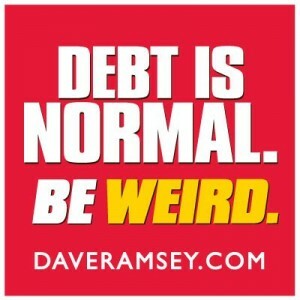 We’re big Dave Ramsey fans too, it sure feels good making smarter financial decisions. Thanks for the encouragement!!! So fun to hear the first installment of the house story! Hurrah! I’m so proud of you guys!! Enjoy your new home. Wow! You are a unique piece. Whenever I feel low, I’ll think of your family and your achievements. You’re setting an example for all of us. I’m not a christian. I believe God is one. It’s just that we pray differently. But I’m amazed to see how dedicated you are to God. Thanks for such an inspiration. This is so inspiring.. as my husband are on our baby steps and a matter of months of being debt free! Keep up being weird… because no one said living like no one else was popular!! Your story and dedication is a story worth telling and living boldly!! Yay! I’m so happy and excited for you and your family! However, I can’t wait ANY longer! So hurry up and share it with us, your patient and faithful readers! We can’t wait to see pics! What blessing! And lots of hard work. You are a real example of what can be done if you stick to a goal. God always seems to provide at just the right time. Can’t wait to see the photos. Good for you! I say there is no need to work your backside off to line the pockets of the bank with interest payments. My husband and I were planning on building a new, yet still simple and not too big, home on our land. We have decided instead to just buy a couple of cheap rental house with that money, and just fix up the home that we have now, especially in this economy. What security it will be for your family knowing that you don’t have a house payment and what a great lesson to teach you children, that you don’t have to go with the norm and have that mortgage. Congratulations! I am thrilled for you and your family. May God continue to bless you. That is a very good idea kelly. And with the way the economy is now you will not regret that at all. Good luck! Girl, you know how to tell a story….and you know just when to quit in order to leave us hanging! I can’t wait to hear how the story ends. And I’m pretty sure we all want to see pictures of this dream house that you have so patiently waited on. Congratulations Crystal! Can’t wait to hear more of the story and see pictures of the house! I just wanted to encourage you and anyone else who has been renting a ling time. We rented for six and a half years before out first house, then sold it, moved, and rented another two years before our current home, and I’m only 30! Sometimes renting is the best move, until you find what’s right for your family. I agree that renting long-term can be a wise choice in certain circumstances. In fact, I wrote an article for a finance site on that very subject recently. I’ll be linking to it when it is live. This has been a very encouraging series! It has helped me to be more patient with the “house buying itch” that I seem to have. I can’t wait to hear the rest of the story! I’m loving this series! Can’t wait for the next part. I live in a big city and in a nice part of town. The only thing we could ever afford cash is a townhome/condo (saving 10 million plus cash is not an option for us). It worries me though that even paying cash for a condo – we would still have a monthly obligation to a Home Owners Association. Esp. since those fees can go up every year. Right now we have enough cash to buy a condo outright but I am still unsure if it is a good idea because of the monthly HOA fees (they are $400.00 a month for the complex I like). Any thoughts? Kudos to you! And yay for your buyer, too…they probably flipped when they got a cash offer! LOL! Congratulations!!! Can’t wait to see pictures! This is so inspiring! Thank you so much for sharing your story. Congrats! Congratulations! I am so very impressed! Congratulations to you! I look forward to the story of how you found THE house. You are an inspiration! Congratulations! That is so exciting and I can’t wait to hear more details! congrats! Can’t wait to read more! So it’s true: you’re not perfect–you actually sometimes slack in sticking with the budget! Please don’t take this the wrong way, but it’s almost encouraging to hear that, because it happens to even the most frugal people in the world. Thank you for sharing that little detail that you could have easily left out. The reality in your case is that you obviously work well when you have set goals and a plan to work towards. That is an area that I really need to strengthen in my own approach to household management. So thanks for letting me learn from you! I’m really looking forward to following the story–your example is such an encouragement! Oh goodness! I’m far from perfect! We try to be really militant about sticking with the budget because it makes such a difference in our finances, but we definitely have had seasons of slacking in the past — and probably will in the future, too. We have to have frequent reality checks and money meetings to help keep us on track. It’s so easy to start getting lazy about it otherwise!